Preheat oven to 176°C / 350°F. In a medium bowl, use a wooden spoon to cream together: butter, flour, and icing sugar. It will form a ball. Meanwhile…with a mixer on High, beat: granulated sugar, lemon juice, lemon peel, baking powder, salt, and eggs. Add everything at once, beat 3-4 min until fluffy. As soon as crust is finished baking, pour liquid onto hot crust. Test for doneness by lightly pressing down onto the top, when it’s done, the top will spring back up, but if it leaves an indentation it’s not done. Cool 1 hour (in pan). 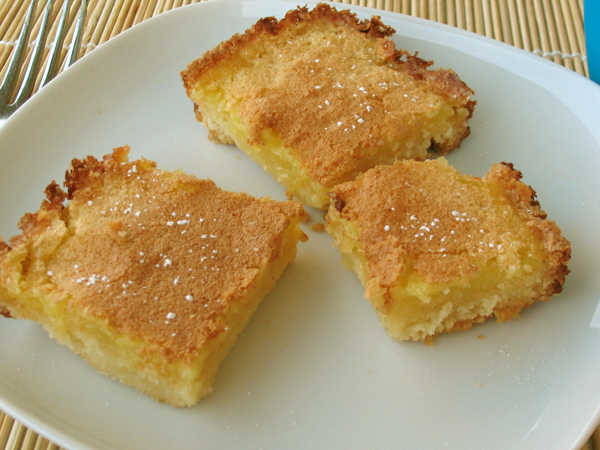 Cut into squares and sprinkle with icing sugar. She should of cremaed the cream cheese and sugar first. It would of made the mix smoother in the long run. At the end she should of folded in the eggs, not mixed them in. I never use just pumpkin pie spice. I use all the individual ingredients as I have them in my spice rack anyways, so why add another﻿ bottle?